The ceramic sculptures by Lauren Nauman are a series of bespoke vessels made of numerous fine vertical lines forming a cylindrical vase shape where each one is elegantly warped such as a fabric is curved by a sudden gust of wind. Lauren’s body of work from the series “Lines” builds on experimentation and chance, but also conveys the maker’s control and confidence over the material she works with – casting slip, a liquid mixture of clay suspended in water. When I was observing Lauren at work the studio turned calm and quiet. Not literally, because as she crafted we continued the interview and listening back to the recordings there was plenty of background noise coming from the adjacent studios. In that moment however and even though the window of her studio’s front door is missing all the noise of heavy woodworking machinery had faded. Lauren is sitting almost motionless at her desk, high as a counter, slightly leaning over the object she is working on. Her movements are precise and slow and what I receive as quiet is her deep concentration and full control over the work. Lauren Nauman, born in 1990 in the US where she grew up and was educated in fine arts moved to London/UK in 2014 for an MA in ceramics & glass at the Royal College of Art. Since Lauren graduated in 2016 she continues to develop her successful vessel collection “Lines” and has been awarded the Young Masters Maylis Grand Ceramics Prize, Highly Commended in June 2017. Her early experience with clay was with the traditional field of ceramics gaining in depth expertise in mold-making, firing and even making her own casting slip. During the MA she was given the freedom to experiment with different techniques and processes. 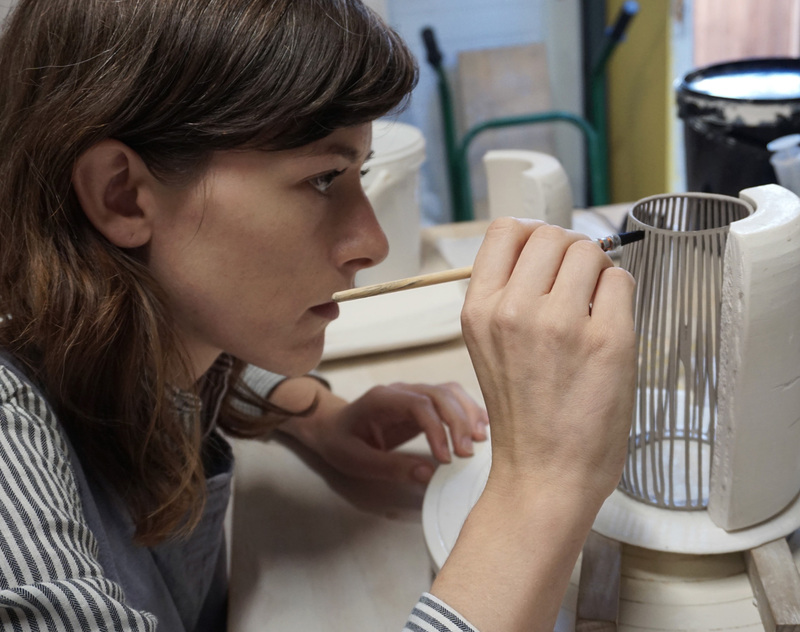 She started experimenting with airy structures in clay that resemble woven baskets and finally came up with the technique of making a cage like structure of single lines. For this she is evenly dripping porcelain slip down the inside wall of a plaster mold, which is traditionally used to cast entire shapes. Her current workspace at the Sugarhouse Studios in South London contains an elongated wooden desk along the length of the wall, shelves and her very own kiln, which she auctioned on Ebay. 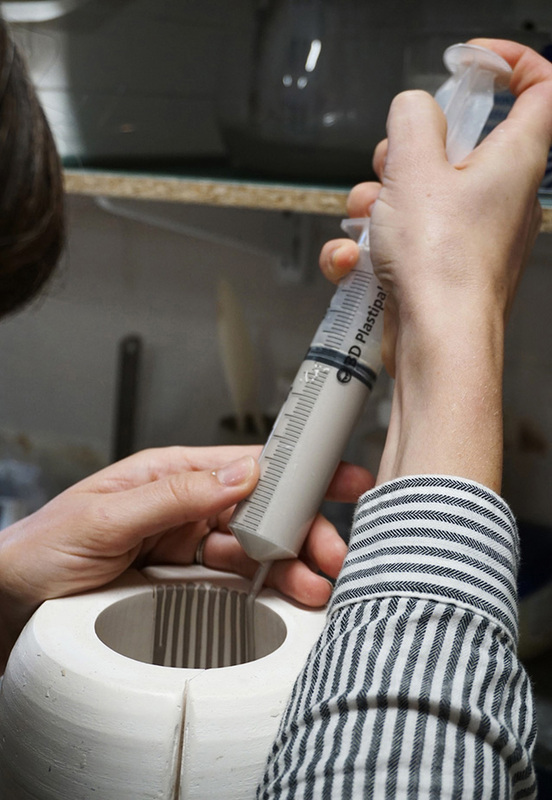 Here at her desk she creates her sculptural vessels with only a casting mold, a bucket of casting slip and a 100 ml syringe in hand. This process indeed needs practice and confidence. The aura of calm is Lauren focusing on the process by controlling the slip in the casting mold. Each sculpture is patiently built of immaculate lines made of casting slip, which she applies with the syringe one by one. While I watch I am captured by the steadiness of her hand. One does not need to be present to imagine the immense control and concentration it takes to create those perfect lines. Look at the photographs closely and you may witness the deep focus that radiates from her hands and eyes. Of course this is not all there is to it. Lauren is telling me that finding the right shape for the casting mold is what took her the longest to develop. It was a long process of trial and error finding the correct shape that would hold the lines of casting slip during the making. 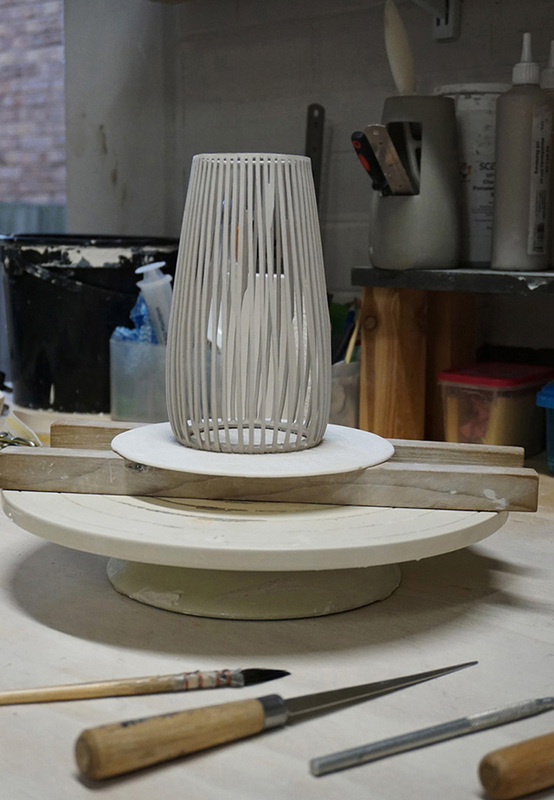 Ceramic is a difficult material to work with as the making of a piece relies on so many components, such as consistency of the raw material, the regulation of dampness throughout and the process of air drying when the object becomes most fragile. Clay is a material with a memory – at the end it will show mistakes that were made during the process. 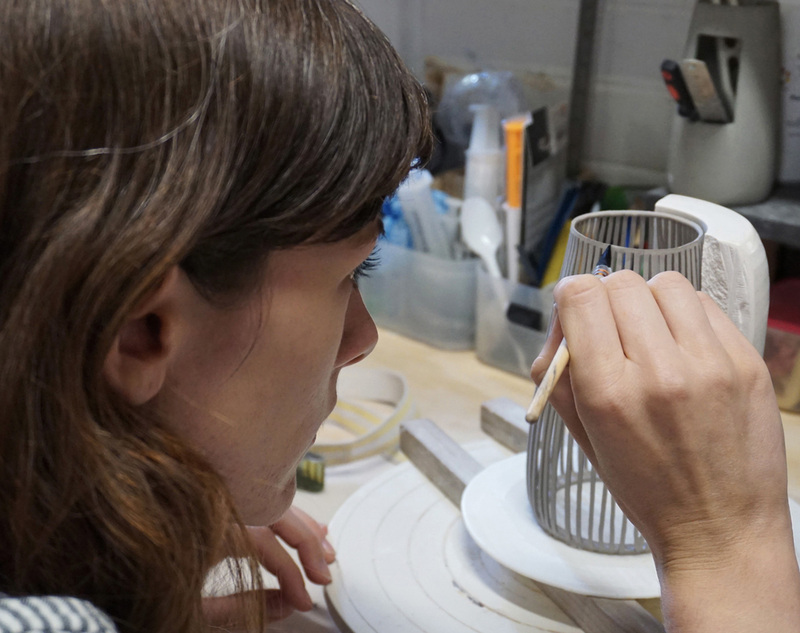 The latest challenge Lauren was facing was to create vessels that measured 40cm in height for the Future Heritage show at Decorex International in London. The participating craftsmen were asked to exceed their existing designs in size. For that Lauren had to apply more layers on each line to gain the strength such a large object would need to keep its stability. 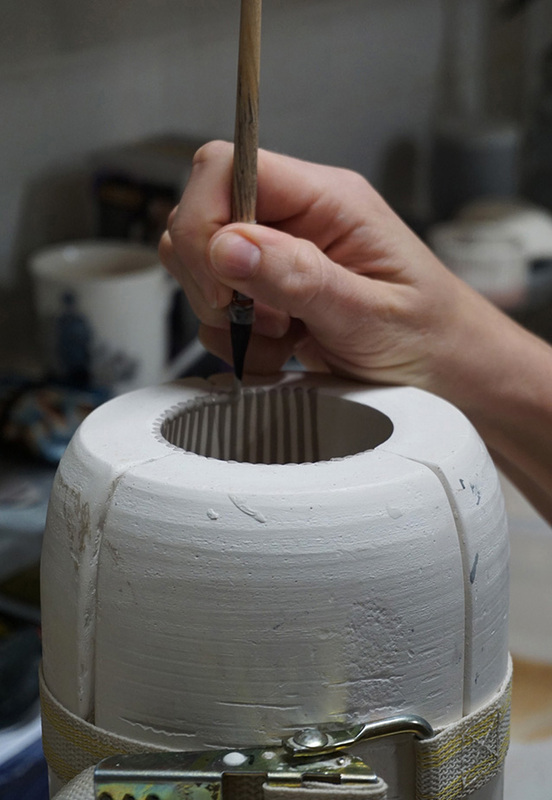 After crafting the lines Lauren changes from syringe in hand to a very fine brush that she uses to build the rim at the top of a vessel – steady hand as she goes. The process became a race against time to keep the humidity of the casting slip in best working condition. 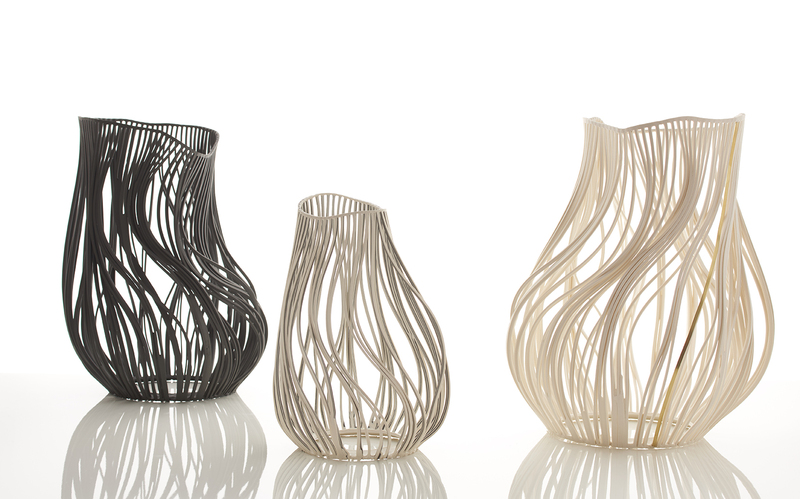 The time component and the precision of her work reflect all her experience and confidence over the material. Between the fine lines of control and confidence Lauren boldly adds chance. During the firing, the final step in the process, Lauren chooses to fully leave the sculpture’s success to its reaction to heat. While the clay is fired in the kiln the immaculate lines move to the temperature of the fire, they dance like fabric in the blowing wind. This effect works due to the lack of a cross support in horizontal lines for the structure. The clay freely transforms lead by its intrinsic properties and finds its final shape autonomously. The fired sculptures seem as if the gust of wind had suddenly been interrupted and captured in a particular timeframe. The most surprising about each sculpture is the impression of the opposing qualities: the sense of a dynamic movement and the distinctive fragile materiality of porcelain.